Grilled menu can be your ticket to success. It is no secret that Filipinos love to eat and they love their grilled meats. Lechon kawali, pork barbeque and chicken inasal are staples found in restaurants and fastfood joints. 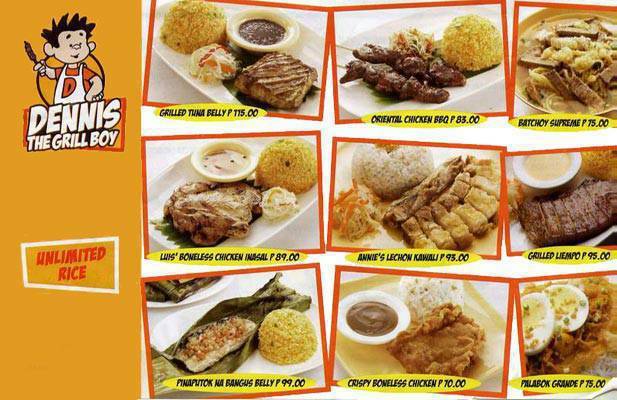 Dennis the Grill Boy offers a delicious take on these grill classics without the high price tag in addition to being one of the few Filipino grill restaurants offering unlimited rice. The franchise fee covers operations support, use of brand and trade name, opening marketing support, and training support. The total investment, depending on the size of the outlet will come to around P5.5 million. The cost includes the franchise fee, store equipment, building and leasehold improvement, signages, POS systems, refundable security deposit, furniture and fixtures, working capital, and initial supplies. For inquiries, you may send your letter of intent to dbnakpil@yahoo.com or call Dennis Nakpil at +63917.800.1865.